LOS ANGELES, April 8, 2015 /Christian Newswire/ -- Of the one billion Catholics worldwide, very few are ever considered for sainthood. Though many people live good and holy lives, a reputation of sanctity just isn't enough. Sainthood causes take time, human resources, money, lots of prayer, and "just plain hard work." This, according to Fr. Kevin Pius Manion of Rancho Santa Fe, CA who has been working on the cause for the late Claretian Missionary, Fr. Aloysius Ellacuria, C.M.F. (+1981). According to Manion, the "contemporary" causes of sainthood should be brought within 30 years of the servant of God's death. This ensures that living witnesses, even those not favorable to the candidate, will be heard by the church tribunal set up to establish if the candidate exercised virtue to a heroic degree. In the case of Father Aloysius, and due to the filing delay, this 30 year window may have passed. But here is the irony. 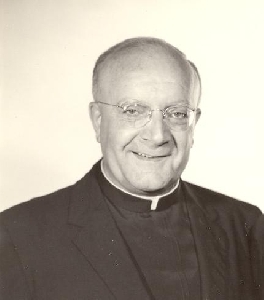 Before his death on April 6, 1981 Father Aloysius left instructions that his archive remain confidential for 20 years. In other words, Fr. Aloysius may have delayed his own cause of sainthood! When Manion became aware of the 30 year deadline, he petitioned the Archbishop of Los Angeles, Jose Gomez, to open an inquiry. That was 4 years ago, and before the 30 year limit. Fr. Manion didn't know the protocol, so under the Archbishop's guidance, Fr. Thomas Anslow of the tribunal instructed Fr. Manion to secure the services of a suitable postulator. Last year Dr. Andrea Ambrosi, renowned expert in sainthood causes, met with the archdiocesan tribunal staff. Then on Sept. 8, 2014 Archbishop Jose Gomez established the "Association for the Beatification and Canonization of Fr. Aloysius Ellacuria, CMF." Unofficially, the Archbishop may schedule the official "opening session" for sometime in June 2015, pending filing requirements. That's great news for those supporting a cause for Father Aloysius. It could also be historic for the "City of the Angels" which could soon have its own saint. The public is invited to the 34th Annual Memorial Mass for Fr. Aloysius Ellacuria, C.M.F. which will take place at the San Gabriel Mission this coming Saturday, April 11 at 10:00 am. Contact the San Gabriel Mission secretary at (626) 457-3035 for details. Information on Father Aloysius and the cause for sainthood can be found at www.aloysius.com.